Born Propeller was established in 1985 because we wished to make the vision for different developments of propeller theories out of human powered flight and the methods of calculation of Gene Larabee applicable for microlight aircrafts. At that time there was only Dieter Schmitt, later on working with DG Flugzeugbau, who applied modern theories of the development of aircraft propellers. But Schmitt himself had no manufactory either, so his developments could not gain a wider distribution. In 1995 we took part in the Aero as manufacturer for the first time and instantly concluded a contract with Norbert Schwarze, the inventor of the minimum drive for hang-gliders. For many years the propellers for this kind of drive had been our main products until the development of paragliders began. Out of a propeller delivered to Norbert Schwarze we made the first with 55 db/A licensed propeller for Fresh Breeze in Hanover (Germany), in these days also just a garage manufactory. This propeller is almost unchanged still part of our manufacturing program and has been copied 10.000 times all over the world. At the same time Bernd Gärtig had developed the Pagojet, for which we also delivered a great number of propellers until they were copied as composite constructions, the drive conception was outdated and the König engine was not available anymore. From 1985 we have been working with CNC technology and a special calculating program developed by Gene Larabee and Bernd Karl. At those times this technology actually was unaffordable and the software would have cost a fortune. Thanks to a school friend who had also been infected with flying, we were enabled to construct a CNC milling machine by ourselves at an extremely favorable price. This machine - beside one from 2008 - is also still working. Hubert Jäger developed the complete software and made it available for us at no charge. From 1989 we had an electronic 3D measuring system allowing for considerably improving the quality control and for copying of propellers. In the period from 1989 to1995 we had a close cooperation with MT Propeller, Mühlbauer, for whom we manufactured fixed pitch propellers and components for variable pitch propellers as a subcontractor. Different types of propellers of the Schleicher power glider ASH series sold at that time and equipped with Walter Binder engines flew with propellers developed and manufactured by us and licensed by MT. Due to rapidly increasing production costs, we moved to Romania in 1996 where the manufacturing of propellers was in abeyance for a long time until we resumed production of old and new types of propellers again in 2007. Now in the fall of 2013 we have delivered 14,500 propellers in total, flying almost in all countries of the world and unfortunately being gladly copied in the Asian countries. After our rented workshop had been completely destroyed by a fire in 2010, we made a new start with the financial help of friends. In the meantime we have built a new workshop and we have a private airfield for test flights at our disposal. Selling about 500 propellers per year does not mean that we are the market leader, but we can definitely offer the largest share of individually adapted solutions. 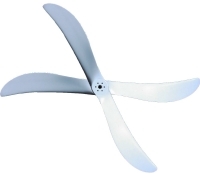 There are hardly any manufacturers offering individual propellers for reasonable prices by now. Born Propeller is one of these.